When a friend of mine comes to visit from New York he always brings me macarons from this little bakery on the Upper East Side called Bisous Ciao. The rainbow macarons are simply to die for. This time I asked for something sinful in a different sense, a bottle of Bulldog Gin. I haven’t been able to find it in California and have been dying to taste something different. Bulldog gin features poppy and dragons eye. Dragons eye is known for stimulating vitality and sexual stamina…interesting. With it’s natural stimulating effects I wanted to create a smooth, seductive cocktail. Bulldog gin begins by tantalizing ones senses with a fresh bouquet of citrus and floral notes. The gin brings forward hints of lavender, citrus and juniper to follow. Chateau de Laubade Blanche reveals pear, peach and honeysuckle. Layered with Lillet Blanc’s ripe kiwi, tangerine and herbal warmth. 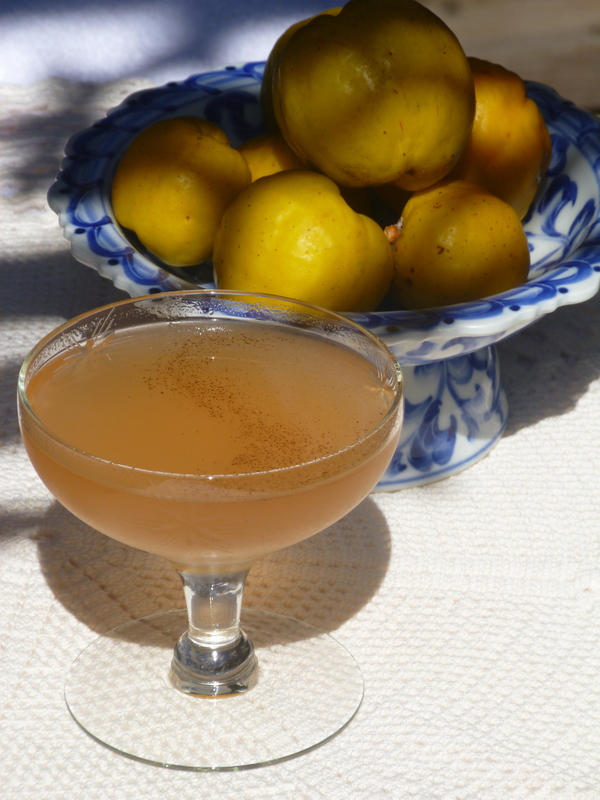 Quince syrup adds a velvety smoothness and orange bitters brightens the bouquet. I have suggested a grate of nutmeg to spice up your senses. Quince me honey is a delicate cocktail but don’t be fooled the dog is defiantly out of it’s cage. Stir all ingredients in a beaker with ice. Fine strain into a chilled coupe and garnish with a light grate of fresh nutmeg. Carefully peel skin of each quince. Cut out core and seeds. Cut quince into one-inch cubes. Add all ingredients into a stockpot. Add enough water to cover the entire quince. Let simmer for four hours adding additional water when needed. Let cool. Place quince in a blender and blend until smooth. Use a fine strainer or cheesecloth to strain out any remaining fruit. Store in an airtight container refrigerated for up to two weeks. Or purchase Quince Pate at Williams of Sonoma. I put one part Quince Pate with equal parts water in a small saucepan. I warmed it up until it formed a syrup and it was just as tasty. Quince Pate can be found here at Williams of Sonoma.